Myanmar has so much to offer in this dawn of tourism: local Burmese who live a simple way of life, endless ranges of evergreen forest, beautiful scenes of lush nature, exotic food to please your palate. 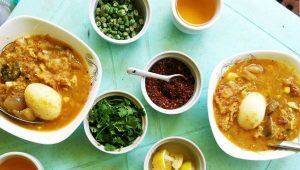 When it comes to food, the itinerary to Myanmar of a new coming visitor will never be completed if he or she has not tried Mohinga (မုန္႔ဟင္းခါး) or Laphet (လက္ဖက္), two of the unique and local dishes in Myanmar. Many people have already heard about Mohinga as a unique characteristic of Myanmar. It’s the same for pizza that represents Italy, hamburger for the USA, tea for England and chapatti for India. Mohinga is also considered an all-the-time favorite snack, from breakfast to lunch, during an afternoon tea break to supper. You can easily find it everywhere, but door to door service hasn’t been made available so far. Markets, school canteens and pavement stalls are common places where you can have it. Sometimes, at least once a day, you can see a vendor walk a small pushcart along the street or balancing a basket on top of the head. From the nutritious point of view, Mohinga is rich in protein and carbohydrates as well as vitamins and minerals. It is a popular dish partly because the ingredients are cheap and easy to find. Also, how to cook it is easy and simple. The general recipe includes the following items: rice noodles, fish (the type of the fish depends on your budget and preference), fish or prawn sauce, a small amount of salted fish, banana stems, garlic, pepper, ginger, onion, turmeric power, rice flour, dried chili powder and a small amount of cooking oil. The most common species of freshwater fish that go into the broth are carp, catfish and butter fish. Even the contents are not so different from region to region, their cooking methods for the broth differ. Each state, each town, even each shop has its own secret recipe to cook different and attractive dish. My favorite style of Mohinga is the one with coconut milk. The milk heightens the aroma and flavors in the dish. This recipe, however, is believed by the elders that it tends to raise blood pressure. So, my grandma is not keen of that type of Mohinga. People who live along the coastal region use sea fish to cook Mohinga, and the most famous one is called Myaung Mya. The upper-Myanmar Mohinga is a little bit different because fish is replaced with dahl (a type of bean) flour. So, the broth is thick and not really to my taste. Rakhine Mohinga is also famous for its totally different style. It includes a variety of hot chili pepper, which will burn your tongue and palate if you are unaware. So, Rakhine Mohinga is named “Ar Pu Shar Pu” (အာပူလ်ွာပူ) or Hot Palate, hot Tongue Monhinga. Absolutely, all of these types are typically native and second to none. You should try it on your visit.